This eye catching cuff bracelet is sure to garner lots of attention as it sparkles on you arm like shimmering waters. 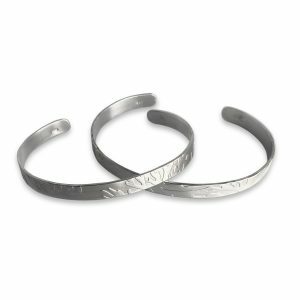 18 gauge sterling silver and hand hammered to create the shimmering water effect and gentle curve in a substantial yet very comfortable bracelet. 3/8″ wide. Fits a small to medium woman’s wrist. This listing is for the medium bracelet which is the top bracelet in the photo.